LM loves Peppa Pig and we've amassed quite a collection over the past few years. 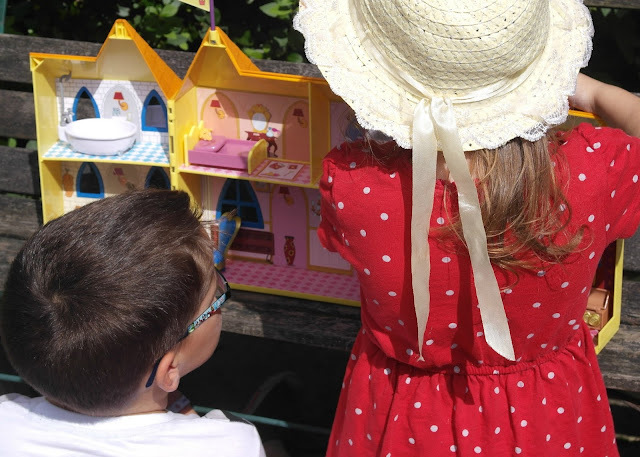 From the Classic range of toys through to the Holiday sets and Once Upon a Time, they've all been really popular toys here and the Peppa collection is played with on an almost daily basis. 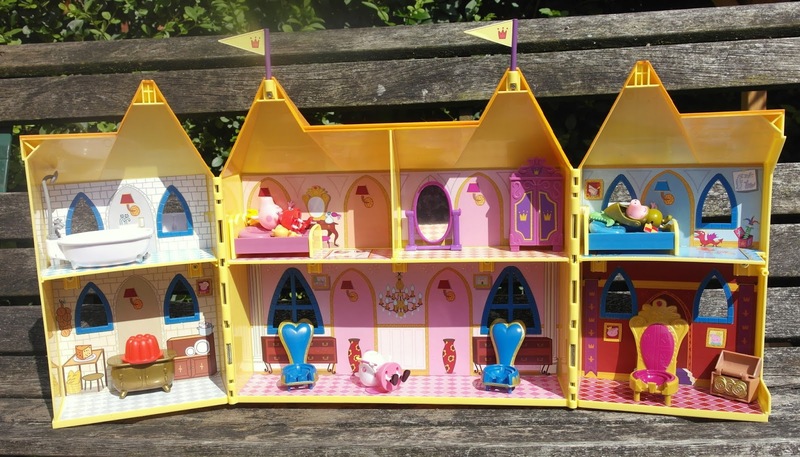 Recently LM was sent the brand new Princess Peppa's Palace from Character Toys and it looks like we have another hit on our hands. Unboxing the Palace is an easy process. 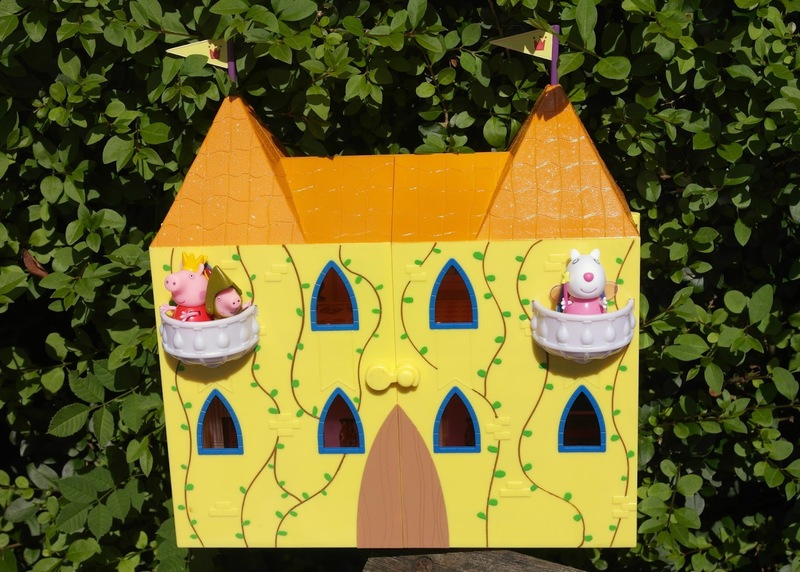 The bright yellow building unfolds it's doors to open out to reveal the palace interior. Helpfully this locks to make storing the Palace accessories inside an easy process. Included are Princess Peppa, A small amount of assembly is required as two balconies are clipped on to the front, two small flags added to the tops of the palace's towers and the bathroom floor is clipped in.. Sir George and a Fairy Godmother Suzy Sheep. 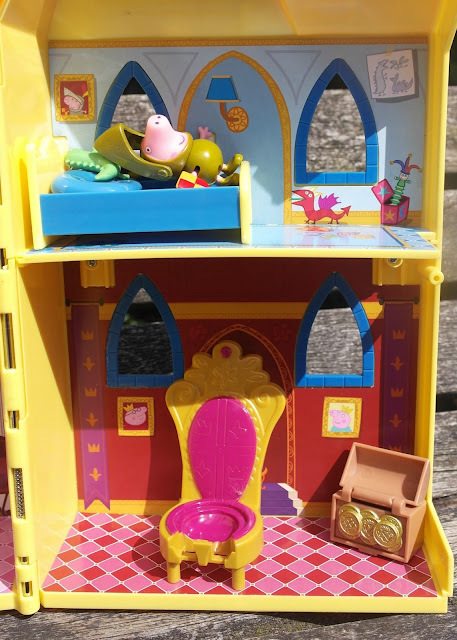 As usual there is a range of furniture included - Peppa and George's beds, pillows and favourite toys (Teddy and Mr Dinosaur), three thrones, treasure chest a sideboard and jelly, wardrobe, mirror and bath tub. The interior of the palace is brightly decorated with the purpose of each room clear to see. There are windows in most rooms and it's easy to work out which piece of furniture goes where. 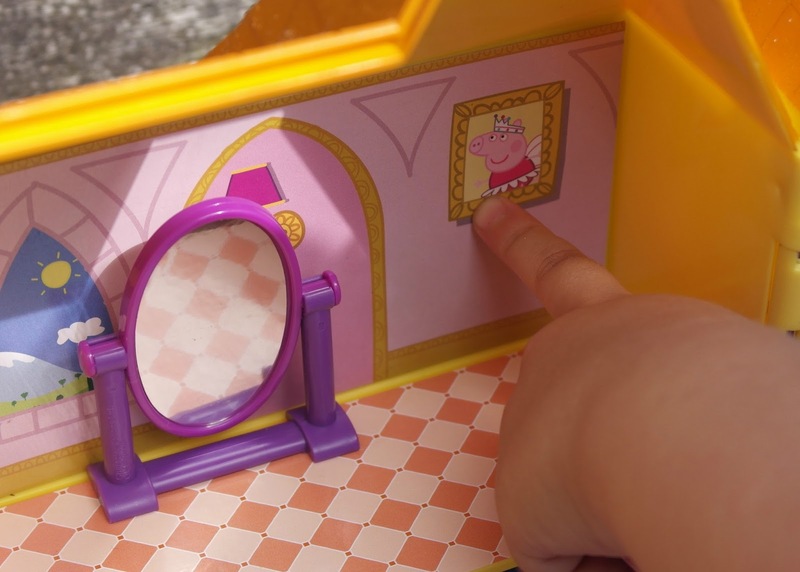 This did meet with a little bit of an argument over which was Peppa's bedroom, with LM deciding it had to be the one with Peppa's photo on the wall and Bud choosing a different option. The set lends itself to imaginative play beautifully. The different characters included and the accessories have had LM creating lots of different scenarios and it's funny to hear replays of the television show in her play too. All of the set is of the usual high Peppa Pig quality we have become accustomed to. They are all sturdily built and perfect for little hands. I'm really liking that, even though the same characters are in lots of the different sets now, they do make effort to make their outfits look different so we aren't adding to the collection of identical Peppa Pigs that we have. 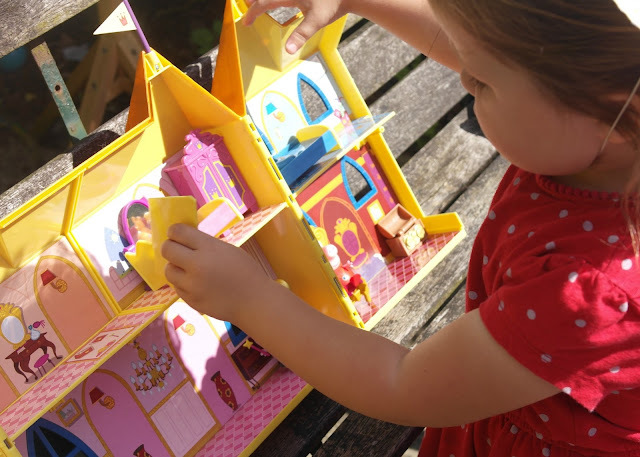 It makes such a difference to LM that she has a Peppa which clearly identifies with a particular set. I'm not sure why but I'm not almost 4! There are a couple of little niggles with this set which I've noticed. 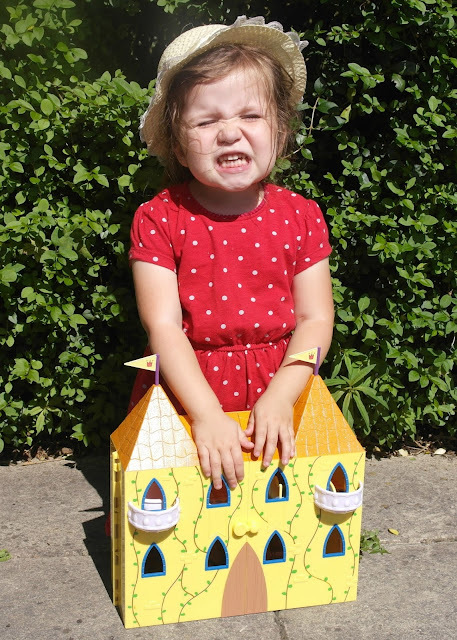 The design of the palace makes it perfect for taking out with your child. A carry handle on the top would make that much easier. The inside of the Palace is large enough to store a good collection of other Peppa Pig characters and toys but you need to make sure not to put small items in the rooms with the larger windows as they will fall out. All in all this is a lovely playset. It's been a huge hit here, with Bud and Little E enjoying playing just as much as LM. 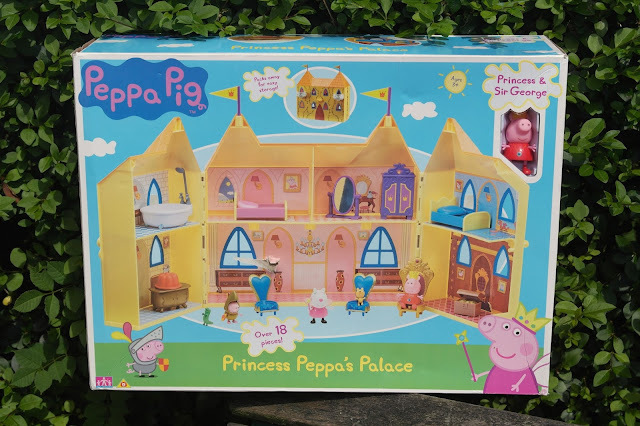 I can imagine it being a hugely successful addition to many Peppa Pig collections . Princess Peppa's Palace has an RRP of £49:99 and is available from Smyths Toys.